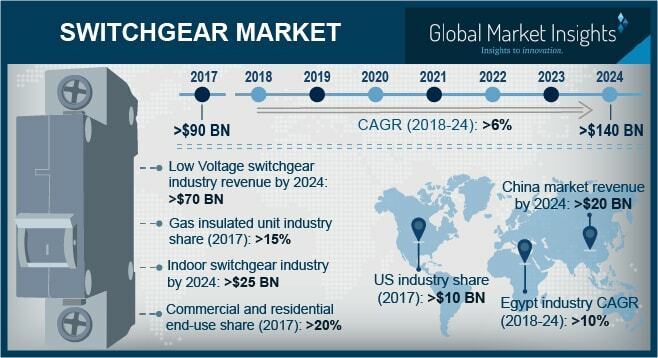 Switchgear Market size will exceed USD 140 Billion by 2024, as reported in the latest study by Global Market Insights, Inc. Rising investment towards the infrastructure development across developing economies will stimulate the switchgear market growth. Growing demand for control distribution systems and advanced monitoring units along with the replacement and modernization of aging electrical networks will further enhance the business outlook. The Government of Serbia targets the upgradation of its present grid infrastructure and entered into a strategic partnership with the Government of China. China has further proclaimed, investments over USD 6.14 Billion in 2017. China market size is set to reach over USD 20 Billion by 2024. Initiatives taken by the Government corresponding to substitution of conventional sources of energy with sustainable and clean energy resources will strengthen the industry outlook. In 2017, as broadcasted by National Energy Administration, amplification of renewable power generation technologies across China to involve an expenditure worth USD 326.38 Billion by 2020. Paradigm shift towards conservation of energy and stringent environmental regulations will fuel the growth of the global market. Swift advancement in smart grid technologies and increasing focus towards energy efficient environment will further embark the product demand. In 2017, Western European countries including UK, France, Germany, Italy and Sweden together, declared a cumulative investment of USD 133.7 Billion for smart grid network expansion. Vacuum insulation in 2017, retained over half of the switchgear market share, attributable towards the growing demand for HVDC transmission networks across the industrial sector. Compared to its counterparts, the high insulation and effective di-electric strength coupled with cutthroat installation costs will further energize the product trade. Toshiba estimated an investment of USD 30 Million towards extension of its switchgear and transformers manufacturing capacities in 2017 across India. Pragmatic measures toward electrification of rural regions across Africa and Asia Pacific sustained by increasing investments from financial institutions including the World Bank and Asian Development Bank (ADB) will uphold the global market size. Restoration of electrical grids across the war affected regions of Syria, Sudan and Iraq will further complement the industry growth. In 2017, the World Bank announced an investment worth USD 4 Million in coherence to the Rural Electrification Project II across Vanuatu for the expansion of electric grid infrastructure across the Pacific Island. Soaring demand for refurbishment of maturing infrastructure coupled with robust adoption of modern distribution networks will bring positive impact on the U.S. market size. Increasing investments in the railroad infrastructure projects backed by government-backed peninsula corridor project will enhance the industry dynamics. In 2017, The U.S. Federal Transit Administration revealed an investment worth USD 100 Million towards development of rail networks in California under the Peninsula Corridor Electrification Project in San Carlos. Prominent players across the switchgear market include Siemens, ABB, GE, Mitsubishi Electric Systems, EATON, Schneider Electric, BHEL, Toshiba, Crompton Greaves, Hubbell power systems, Hitachi, Powell Industries, Fuji Electric, Hyosung, Rittal, Hyundai Ideal Electric, Larson & Turbo, Ormazabal and Iljin Electric.